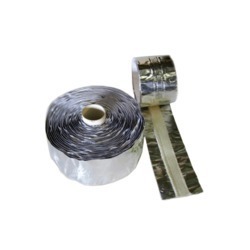 We are leading Supplier and Manufacturer from Thane, our product range includes Welding Tape such as Ceramic Welding Strip, Ceramic Backing Strips, Fiberglass Welding Tape and Welding Strips. These are offered at reasonable and competitive prices. is a 75 mm wide, metallic heat resistant adhesive tape, which has a 25 mm wide cloth strip of fiber glass having center red line which is held up against weld preparation area and maintains weld in same plane as plates or tubes being joined. Available in light duty use up to 80 amps and heavy duty for use up to 160 amps. For above 160 amps, different product of fiberglass band with refractory silica glass in the center is available. Both the types of tapes, i.e. light duty and heavy-duty tapes, are available in 20 Meters long rolls. Provides incombustible, high temperature stability. More flexible, low thermal conductivity, good thermal shock resistance, good mechanical and chemical agents resistance, good electrical properties. Our organization is involved in manufacturing, supplying and exporting a superior quality range of Fiberglass Welding Tapes. Manufactured using high-grade raw material, these tapes are developed in compliance with international standards and norms. 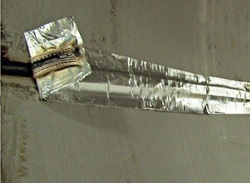 Fiberglass tape is a perfect substitute for asbestos tape.